Bernice on RW [rock writings] -- You can read them -- there is an Old Time word for "writing" in the lang [language]. Idea of messages from yr to yr [year to year] while hunting, gathering. One designated writer for men, one for women. According to Bernice, there are rock writings at the museum office. She wants me to go have a look & tell her what I think they say. Bernice is on the museum board. 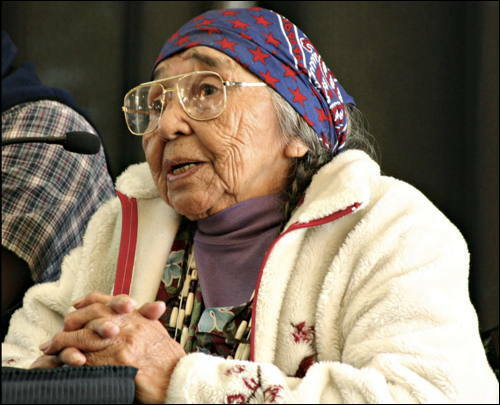 3/16/2019: When I was Storyteller in Residence at the Warm Springs Indian Reservation in October of 1987, I spent quite a lot of time chatting with Bernice Mitchell, tribal storyteller and wise elder. I scribbled several pages of notes, eventually writing an essay, When the Snow Drifts Out of the Clouds, which I recorded at Warm Springs for broadcast on their tribal radio station. At a time when many archaeologists and anthropologists referred to rock writings as rock art and were insistent that nobody could "read" them, this comment from Bernice supported what Roy Phillips and I were convinced of: they are communication. Insights from elders like Bernice, and the publication of LaVan Martineau's classic, The Rocks Begin to Speak, inspired Roy and I to co-found the Reading the Rocks Project which is still going strong. When the Snow Drifts Out of the Clouds – About Bernice Mitchell, traditional storyteller at Warm Springs. Reading the Rocks Project – Co-founded in 1986 by Thomas Doty and Roy Phillips. Rock Writing Video – A rare video of rock writing master LaVan Martineau interpreting a site in Utah. Rock Writings are Writing – The carvings and paintings are a written language. The symbols tell stories. Includes an Afterword with photos.